Gianfranco Teodoro Bardella, died on Sunday, March 13, 2016 at the age of 79. Frank was born August 3, 1936 in Tientsin, China and lived there until age 12, before escaping to Italy from the war. His family lived in Italy for a few years before they were able to come to the United States through Ellis Island and eventually, made it to San Francisco. It was at the International Institute for Foreign Students that Frank met Barbara, his lifelong love and partner. Over the course of the next 58 years they were married and had three children; Liz, Matt and Vanessa, five grandchildren; Ashley, Brittany, Andie, Lexi and Travis, and three great-grandchildren; Maysin, Lane and Nick. Anyone who knew him understands the amount of pride he took in the work he did- whether it be his family-run tax preparation business, his bonsai trees, or his time spent with the Rotary Club. He began working at PG&E in San Francisco before transitioning to the tax business. Frank and his wife have been operating the business since 1958, with three generations of their family working alongside him. He always went above and beyond for his clients and that was reflected in the many long time clients who became his friends. Frank had an astonishing collection of bonsai trees on which he spent countless hours. In his last years, Frank donated his prized bonsai tree to the Golden State Bonsai Federation. He was always more than happy to teach any willing learner about the ins and outs of bonsai. Frank always made an effort to participate in any Rotary event, whether it be sponsoring an event or participating at the weekly meetings. Frank will be missed by his family and the community alike. The family will be holding a memorial celebration at St. Sebastian Church in Sebastopol. The celebration will not take place until tax time is completed. Please contact Bardella & Associates after April 18 for service date and time. In lieu of flowers, donations are preferred to Redwood Empire Bonsai Society, Rotary Club of Sebastopol Sunrise, or the Bonsai Garden at Lake Merritt. UPDATE: Barbara Bardella announced Frank’s memorial service will be on Saturday, May 7, 2016, at Noon. Location is Saint Sebastian’s Catholic Church, 7983 Covert Lane, Sebastopol, 95472. If you could get the word out to your bonsai community it would be appreciated. 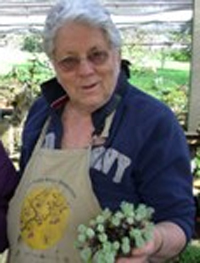 Barbara requested that donations be sent to Redwood Empire Bonsai Society (REBS), Bonsai Garden at Lake Merritt in Oakland, CA, and/or the Sunrise Rotary in Sebastopol, CA.